​All That Dance Studio offers an exciting summer program for all ages and levels. Classes begin on Monday, June 25th. Enroll your child in more than one class or enroll a second child, and receive a 10% discount. Do you have a mini mover who loves to dance whenever music is played? Consider enrolling your child in this class, which meets on Wednesdays, June 26th, July 3rd, July 10th, July 17th, July 24th, and July 31st from 4:30-5:15. Price: $60.00/6 weeks or $11.00 drop-in fee. Your child will enjoy groovin' to the upbeat hip hop moves with some jazz and acro in this class. Designed especially for children, ages 4-9, the music and moves will be appropriate for this age group. This class will meet on Wednesdays, June 26th, July 3rd, July 10th, July 17th, July 24th, and July 31st from 5:15-6:00. Price: $60.00/6 weeks or $11.00 drop-in fee. Move to the groove in this high energy class. The class begins with stretching and doing isolations to build strength and stamina. The student will learn the hottest hip hop movements to popular music. This class will meet on Wednesdays, June 26th, July 3rd, July 10th, July 17, July 25th, and July 31st from 6:00-6:45. Price: $60.00/6 weeks or $11.00 drop-in fee. Students will be taught choreography from kid-friendly musicals; such as, Annie, The Little Mermaid, Beauty and the Beast, High School Musical, and others. This class will meet on Mondays, June 24th, July 1st, July 8th, July 15th, July 22nd, and July 29th from 6:15-7:15. Price: $60.00/6 weeks or $11.00 drop-in fee. Ms. DeSousa. a multi--disciplinary entertainer and a graduate from the University of the Arts with a BFA in Musical Theatre, will return to our Hopewell Studio to teach two musical theatre workshops (TBD) Fee: $25.00 a session. 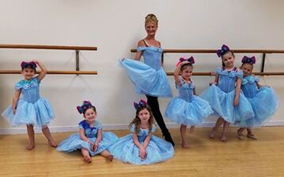 We invite your child to explore the magical world of ballet. 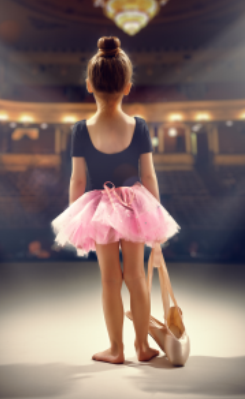 Your dancer will learn basic ballet stepxs and combinations, work at the barre, build technique, develop musicality, rhythm, and balance. This class will meet once a week on Tuesdays, June 25th, July 2nd, July 9th and July 16th, July 23rd, June 30th from 4:30-5:30. Price: $60.00/6 weeks or $12.00 drop-in fee. Just Show Up and Dance...If your kids want to just dance and have fun, send them to our Just Show Up and Dance Nights. We will teach the class the Cha Cha Slide, Electric Slide, Cupid Shuffle, Cotton Eye Joe, and more. You can even make this Family Fun Night! Just $5.00 a person or $10.00 a family per night. Bring a friend and dance, dance, dance! Wednesdays, June 26th, July 3rd, July 10th, July 17th, July 24th from 7:00-8:00. Miss America Parade: Saturday, September 13, 2019 This is our sixth consecutive year that our dancers have been invited to perform in the Miss America's Show Us Your Shoes Parade in Atlantic City. Dancers, ages 9 and up, must audition and upon acceptance, attend the rehearsals in the Hopewell studio on August 14, 16, 21, 23, and 28 from 6:00-7:30. The dress rehearsal wll be held in Atlantic City on Saturday, September 13th between 10:00-1:15 (depending if we are cast one or two). The parade line-up is at 4:30 (Rain or shine). Fee: $150.00 and includes the choreography, rehearsals, parade t-shirt, and bus transportation. Payment must be received by July 20th to ensure that we receive the music and choreography before the first rehearsal. Parents and siblings may ride the bus for an additional fee. The dancers will have ample time for lunch and fun on the boardwalk before performing in the parade. For more information, please contact the studio, (856) 451-2233.